Anyone use these guys before? I need some recommendations for a friend. Thanks! I've always moved myself, I'm considering using a moving service next time though. If I go with anyone I'll post a review. I don't have any idea about Two Guys Moving. but if you looking for good movers you can use Vosco Movers, I have used them recently. Their service was really good and I got perfect Moving Quotes from them.They are very Professional too.You can suggest this movers to your friend. I have their contact details, it might be useful for you. Hey Mary.I gone through your suggestion.Your Recommendation was really helpful for my last weeks local move in Austin.Thanks. 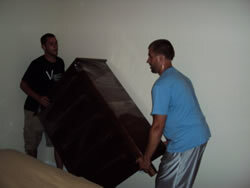 I have recently shifted my house and I took the help of moving services. It's been such a wonderful experience hiring a moving company. They provide best services and help you a lot for relocating your belongings from one place to another place safely. A Friend here in Philly used them ( and me ) to help with her move...the guys from Big Brother / Little Brother did a professional enough move for the $$.